Andrew Rea from the popular YouTube series, Binging with Babish, helps us celebrate the adventures of summer with a collection of delicious recipes paired with Diamond Collection wines. 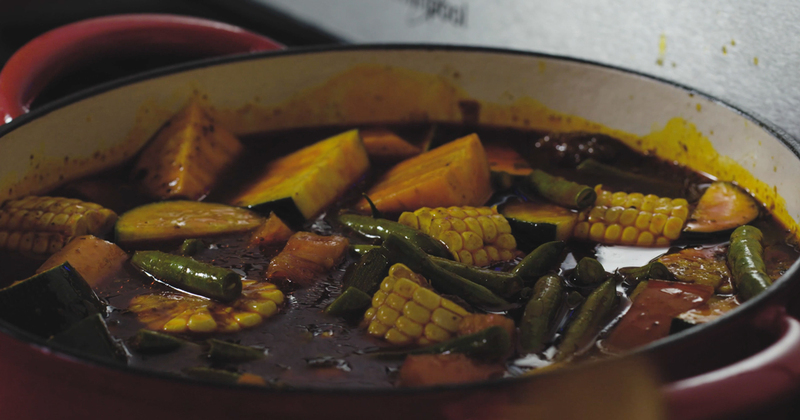 In this episode, Andrew prepares Caldo De Res paired with Diamond Collection Claret. Get the full recipe below. 1½ lb. oxtails, in 2" pcs. Place the meat in a large (should hold at least 6 quarts) soup pot or Dutch oven with 3 quarts of cold water. Bring to a bowl, skimming of any gray scum/foam that rises to the top (these are the impurities and you don't want them in your soup). Once the water is boiling, put heat on medium-low. After the scum has all been skimmed off add salt, onion, garlic, bay leaves, cumin, pepper, and cloves to the pot. Partially cover the pot and simmer it for ~1½ hours. While the broth is gently bubbling, rip the chiles open and toast them on a heavy skillet over medium heat for just a few seconds per side. Place in a bowl and cover with very hot water. Put a plate on top to keep the chiles submerged and let them sit for ~30 minutes. Add chiles to the jar of a blender along with the tomato and 3 Tbs. of water. Process until very smooth. Strain through a medium-mesh sieve into a small bowl and set aside. After the hour and a half is up, skim as much fat from the top of the broth as you can. Stir in the chile puree and the cilantro (or epazote). Partially cover again and simmer gently for another 30 minutes. Uncover the pot and turn up the heat to medium-high. Add the veggies and cook until just tender, ~10 minutes. Taste and adjust seasonings, if necessary. Ladle the soup into bowls, making sure to put some of everything in each bowl. Pass the diced onion and lime wedges for everybody to add to their bowls as they like.